In this Address Book Tutorial in iOS, learn how to add and edit contacts in a fun app about pets. Meet our Furry Little Friends! Although Objective C is an object-oriented language, not all of the frameworks you’ll use while developing for iOS are object-oriented. Some are written in C, such as the Address Book API, which you’ll learn about in this tutorial. The Address Book is the way you can read or modify the user’s contacts from your apps (the same contacts that show up in the Contacts app). ABRecordRef: This is a contact record. It has all the properties that can be entered into the Contacts app. ABAddressBookRef: This is the collection of all the user’s contacts. You can modify its records, add new records, or delete a record. ABMutableMultiValueRef: This is the mutable version of ABMultiValueRef, though it is much more convenient. It lets you set properties of the ABRecordRef that may have multiple entries, such as phone number or email. This Address Book tutorial assumes you are familiar with the basics of iOS development, and are comfortable with the basics of C syntax. If you are new to either of these, check out some of the other tutorials on our site. Alright, let’s dive in and get some addresses! To begin this tutorial, download the starter project that has the user interface pre-made, so you can stay focused on the Address Book part of the tutorial. 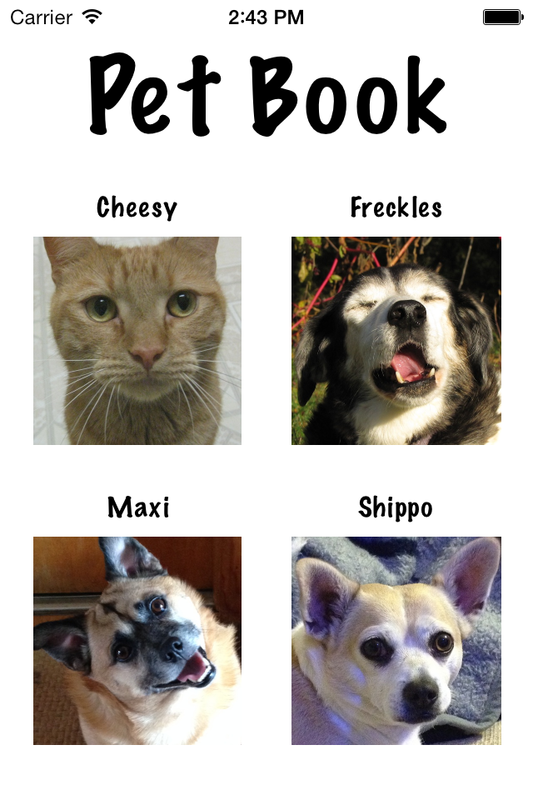 Build and run, and get ready to meet our furry little friends: Cheesy, Freckles, Maxi, and Shippo! Open up ViewController.m. The starter app has four UIButtons that all call petTapped: when pressed. If you look closely in the Utilities/Attributes Inspector in Main.storyboard, notice that each UIButton has a different number in its tag. This will help you distinguish which button is the one that called petTapped:. 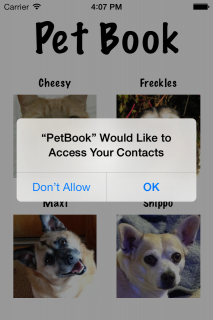 In this app, the user will press the image of one of the pets, and the pet’s contact information will be added to their address book (I’m surprised that even pets have iPhones!). 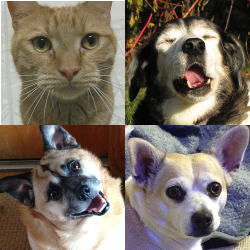 Using the power of the Address Book API, you can finally contact your favorite furry friends. In 2012, there was a controversy regarding certain apps sending a copy of the user’s Address Book to its servers. Because of the public’s response to this security breach, Apple immediately implemented security features to prevent this from happening without the user’s knowledge. So now, whenever you want to use the Address Book, you first ask the user for permission. This checks to see if the user has either denied your app access to the Address Book in the past, or it is restricted because of parental controls. In this case, all you can do is inform the user that you can’t add the contact because the app does not have permission. This checks to see if the user has already given your app permission to use their Address Book. In this case, you are free to modify the Address Book however you want. This checks to see if the user hasn’t decided yet whether not to give permission to your app. In real life when you want something, you ask. Same thing here! The first parameter of this function is an ABAddressBookRef, which you create with ABAddressBookCreateWithOptions(NULL, nil). The second argument is a block that executes once the user responds to your request. Section 4 executes only if the user denies permission when your app asks. This should be treated the same way as when the ABAuthorizationStatus() == kABAuthorizationStatusDenied. Section 5 executes if the user gives permission for you to use the Address Book. This is the same as kABAuthorizationStatusAuthorized. Depending on your choice, you’ll see either “Just authorized” or “Just denied” in the console. Now, press an image again, and you’ll see the result is related to your action before: if you gave permission, it will say “Authorized”, or else it will say “Denied”. Remove the NSLogs, they were only there so you could see the code’s behavior. Note: To debug after each test, it might be useful to use iOS Simulator/Reset Content and Settings. This will let you see the alert that asks for permission every time you reset the settings, which will help later on. Use iOS Simulator/Reset Content and Settings to reset your simulator, build and run, tap the ugliest pet, deny permission, and verify the dialog appears. Good job, iOS citizen! In this method, you’ll create an ABRecordRef with the pet’s attributes, check the address book to make sure the pet does not already exist, and if the pet is not in the Address Book, add it to the user’s contacts. Begin addPetToContacts: with the following. 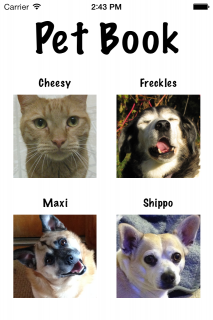 By looking at the button the user chose, you can determine which pet was selected. If the user pressed Shippo, then you want the user to have Shippo’s contact information. The only thing that may be unfamiliar here is UIImageJPEGRepresentation(), which takes a UIImage and returns an NSData representation of it. The first line creates the ABAddressBookRef that will add the pet to the user’s contacts later. The second line creates an empty record for your app to fill with the pet’s information. Next, set the pet’s first and last names. This code will look like this. ABRecordSetValue() takes an ABRecordRef as its first parameter, and that record is pet. The second parameter calls for an ABPropertyID, which is a value defined by the API. Because you want to set the first name, you pass kABPersonFirstNameProperty. For the last name, similarly pass kABPersonLastNameProperty. Does the third argument seem confusing? What it does is take a CFTypeRef, which is the broad type that includes CFStringRef and ABMultiValueRef. You want to pass a CFStringRef, but you only have an NSString! 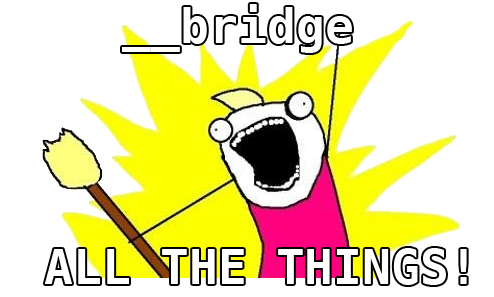 To convert an NSString to a CFStringRef, you have to bridge it using (__bridge CFStringRef) myString;. If you are familiar with “casting the variable,” it is similar to that. Note: For more information on the __bridge keyword, check out Chapters 2 and 3 in iOS 5 by Tutorials, Beginning and Intermediate ARC. Phone numbers are a bit trickier. Since one contact can have multiple phone numbers (home, mobile, etc. ), you have to use ABMutableMultiValueRef. This can be done by adding the following code to the end of addPetToContacts:. When you declare the ABMutableMultiValueRef, you have to say what kind of property it will. In this case, you want it to be for the kABPersonPhoneProperty. The second line adds the pet’s phone number (which is bridged to CFTypeRef), and you have to give this phone number a label. The label kABPersonPhoneMainLabel says that this is the contact’s primary number. Try setting the pet’s phone property yourself. If you get stuck, expand the field below! [spoiler title=”Solution”]It is not that different from setting the name. The last piece of information to add to the record is its picture — you definitely want to see that adorable face when they call to ask for treats! Use iOS Simulator/Reset Content and Settings to reset your simulator, build and run, and tap on each of the pets. If asked, give the app permission to use the Address Book. Once you’re done, go to the home screen (use Cmd+Shift+H to do this in the simulator), and go to the Contacts app. You should see the pets! 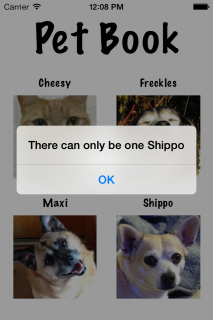 To prevent Shippo clones, you should iterate through all the contacts and make sure that the new contact’s name is not in the address book already. Insert the following sections of code before the ABAddressBookAddRecord() and ABAddressBookSave calls. First, add this line to get an NSArray of the Address Book’s contacts. Notice how you use __bridge going to NSArray in this case. It goes both between Core Foundation –> Foundation and Foundation –> Core Foundation. Next, add this line to iterate through the array so that you can check the name of every record. You have to use id because technically Core Foundation types can’t be in an NSArray, because they are not objects. The ABRecordRefs are disguised as id’s to avoid errors. 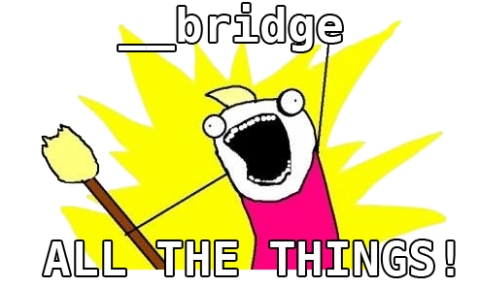 To get the ABRecordRef, simply __bridge again! ABRecordCopyCompositeName gets the full name of the record by joining the contact’s first and last names. This shows an alert to the user and stops the method so the contact isn’t added. If the loop goes through all the contacts and does not find a match, it adds the pet to the Address Book. Run the app, and try to select one of the pets multiple times. Look for an alert that says the contact already exists to appear. There is still a hidden issue with the code as it is right now. If you look at the documentation for ABAddressBookRequestAccessWithCompletion (which is called in petTapped:) the completion is called on an arbitrary queue. In other words, it may be called on a thread besides the main thread. If there is one thing you should know about multithreading, it’s that the user interface can only be used on the main thread. You have to make sure that anything affecting the user interface (presenting UIAlertView?) is called on the main thread. This is easy to accomplish with the following code. Insert this at the beginning of the completion of ABAddressBookRequestAccessWithCompletion. This runs the block on the main thread so you can use the user interface. To learn more about multithreading, read this tutorial. This is the best way for the app to ask permission to use the Address Book. Note that a best practice is to ask for permission only when you actually need to use it — if you ask for permission when the app first launches, the user may be suspicious because they won’t understand why you need to use the Address Book. One issue with ABAddressBookRequestAccessWithCompletion is that once the user gives the app permission, sometimes there is a 5-10 second delay until the completion is called. This can make it seem like the app’s frozen when it’s adding the contact. In most cases, this is not too much of an issue. 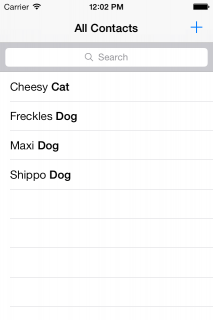 Your PetBook app is now fully functional, and I know you can’t wait to text your new furry friends right away! Here is the finished example project from this Address Book tutorial. You can do many other cool things with the Address Book API. In this tutorial, you learned how to create a new record. As an extension of this tutorial, try modifying pre-existing contacts in the Address Book. Along with this framework, there is also an AddressBookUI.framework that has several convenient classes for modifying the address book. What these can do is give your app functionality similar to the contacts app. If you have any questions or comments regarding this tutorial or the Address Book API, please join the discussion in the comments below!